Custom social media graphics in Huntsville, Alabama that are unique and add tremendous value to your brand. Looking for custom social media graphics? Did you know that visual content is 40 times more likely to get shared on social media than other types of content? Did you know there are roughly 2.56 billion worldwide mobile social media users? With stats like these, you need unique social media graphics that grab attention and drive interaction. That's where I come in! Say goodbye to generic overused stock imagery that makes your social media fall flat. When you work with a professional illustrator, your social media graphics will be 100% original and unique! When you work with me, you are working with a professional who doesn't cut corners. All of my illustrations are rendered by hand with my own signature handmade brushes. These brushes are made from REAL high-resolution textures I create myself. This allows me to create beautiful illustrations that are rich and vibrant. Professional high-quality illustrations can add tremendous value to your social media. Let me share why it is worth the investment. to design your social media graphics. Say goodbye to boring social media graphics and stock images. Say hello to unique and original illustrations that encourage engagement! Custom illustrated Twitch overlays, break screens, intermission screens, start screens, in-game stream overlays, and more! Custom illustrated profile graphics and more! When you work with a professional, you can put your mind at ease. My organized design process, in-depth project questionnaires, BFA in Graphic Design, and professional agency experience means you can rest assured your social media graphics are in the hands of an expert! These beautiful custom illustrated social media graphics were sized for Facebook, Instagram, Pinterest, and blog posts. The end product was a series of unique social media illustrations that were unique and attention grabbing. 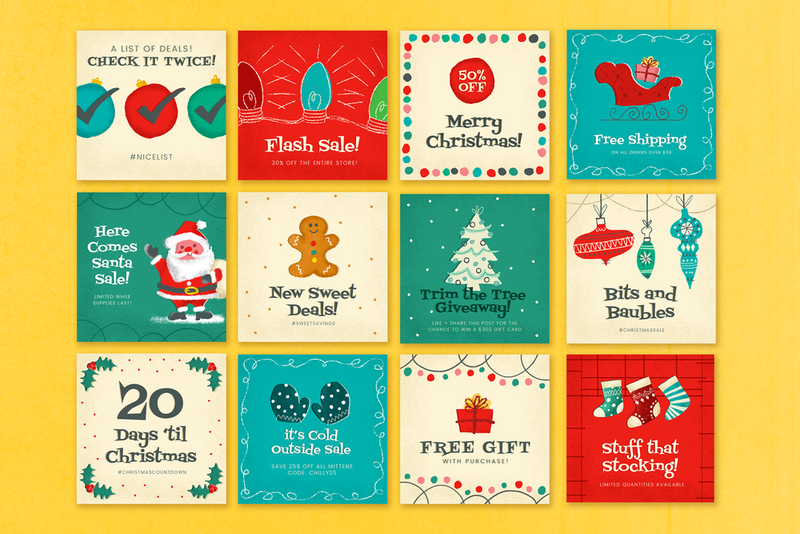 These set of social media graphics were inspired by Mid-Century children's storybook illustrations and vintage Christmas ads. The goal was to beckon viewers back to a time of nostalgic Christmas bliss.